New Orleans’ St. Louis Cathedral faced a myriad of obstacles through its circa 300 years of existence. It was first built in 1718, the same year the city was founded under French explorer and colonizer Jean-Baptiste Le Moyne de Bienville. The Great New Orleans Fire of 1788 scorched the original structure, and a new structure was completed in 1794. Enlargement and reconstruction in 1850 eradicated much of the original edifice, giving the city its current building. In 1909, the Cathedral faced an uncharacteristic obstacle: nitroglycerin. On April 25, 1909, hundreds of parishioners departed early Sunday mass. The afternoon schedule consisted of multiple christenings. Slightly before 3pm, a Slovenian family was gathering for a christening with Father Laval, a priest of the Cathedral. A few family members congregated around the altar to await the arrival of other guests. Mrs. Lesley, an elderly woman who frequented the church, was deep in prayer in the last pew. Mary Brooks knelt in prayer a few pews ahead. Cormier, L. E. (1909). 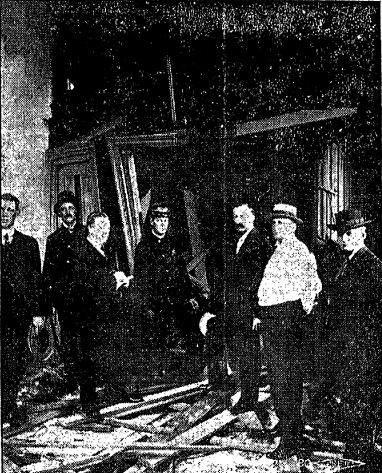 Scene of the Explosion. Retrieved March 1, 2015 from The Daily Picayune. Suddenly, as the altar boy lit his last candle in preparation, an explosion near the entrance shook the cathedral to its core. Stained glass windows shattered into the streets. Chaos ensued as frightened people bolted from the cathedral. Police and firemen quickly assembled. The city’s best detectives rushed to gather evidence. Onlookers gathered to witness the carnage. 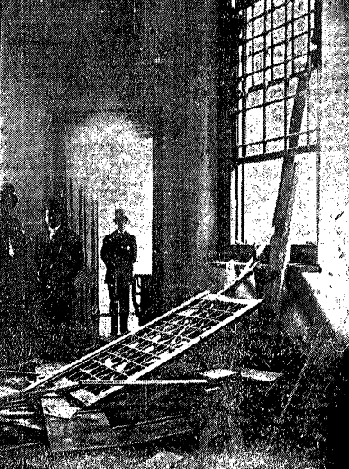 Due to the time and location of the dynamite, no one was injured. The statistic would have been very different had it occurred during morning mass. Fear changed into curiosity as people suspected the culprit and motive. According to The Daily Picayune, the District Attorney suspected “Anarchy or Religious Fanaticism.” Incoming Sicilians were often synonymously viewed as radical anarchists. With Italophobia rampant, Sicilian immigrants were quickly scapegoated. A “message” was sent to the police force notifying them of a suspicious person, Ferdinand Palma, a tinsmith, who should be apprehended for his proximity at the time of the explosions. Palma lived on 632 Dumaine Street, in Madame John’s Legacy, with dozens of other impoverished immigrants, a mere block from St. Louis Cathedral. Angelo Cabuto, his neighbor and closest friend, was also immediately detained for his association with Palma. A riot call was made and a mob summoned at the Jackson Square Station where Palma and Cabuto were held. Both suspects were quietly moved to the Saratoga Station in order to avoid another episode similar to the 1890 mass lynching of eleven Italian immigrants suspected in assassinating a police chief. Others suspected a labor dispute. Father Laval claimed to have heard disagreements between the contractor, Antonio Sindrini, and some workers during renovations. Sindrini, a Venetian immigrant, was called into questioning about his workers, but claimed to know nothing. Mrs. Lesley, who the aforementioned newspaper claimed to have followed the “Arabian faith”, also stated she saw nothing suspicious. Others reiterated similar sentiments. Cormier, L. E. (1909). A Wrecked Window. Retrieved March 1, 2015 from The Daily Picayune. Rewards and bounties were established as the city grew desperate. The mayor and the governor both set rewards for information. Organizations like the Knights of Columbus followed suit. Meetings were held throughout the city to raise funds to repair the estimated $10,000 worth of damage. A Category 3 hurricane a few months later overshadowed the story of the bombing. The disastrous New Orleans Hurricane of 1915, a massive Category 4, significantly damaged the Cathedral. Eventually, life in the French Quarter continued and fear and curiosity faded. The bombing of St. Louis Cathedral became lost in the consciousness of the city. Seems it’s going to take more than nitroglycerin and hurricanes to bring down the oldest continually operational cathedral in the United States.